First off, I really like the conceptual framework that you’ve developed in your posts. Using pictures, film and drawings to help students use information they’ve learned or engage in new learning is great, and a necessary ingredient for quality student learning. With that in mind, I have to mention that there are some very important factors that do not seem to be addressed in the work. 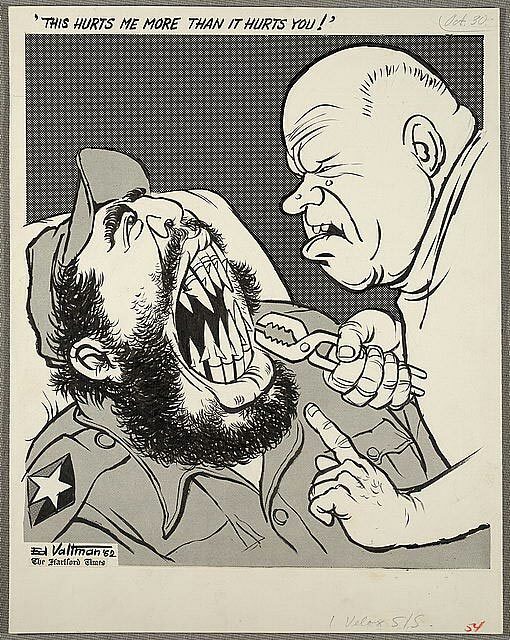 For example, the cartoon depicting the Russian and Cuban dynamic at the end of the Cuban Missile Crisis does involve easily understood imagery and symbolism that is readily accessible to students of many ages, but it also involves a dated, and derogatory, American perspective on two countries through the imagery of their leaders. The depictions of these two leaders also serve as a reflection on the countries and cultures that they lead. As I consider the state of American culture in the 1962, I find these depictions to carry not only a political statement, but also a cultural bias. If I were to work with them in a classroom, I would have to address this issue. I’m an American with a wife who immigrated from Russia and Cuban friends in and outside of Cuba, so I admittedly have an uncommon sensitivity to the subjects at hand. Given that, adding in some critical thinking questions around cultural conceptions in and of America, Russia, and Cuba from the past and present would be helpful to teachers who don’t consider these aspects. So glad you like our blog, thanks! We agree with your comments and would never expect to be able to create all of the possible questions for this or any other resource we post. Our goal is to help teachers find free resources that help save them the time and effort it took us. Every classroom is different and we would hope our readers are personalizing our lessons! If you have any questions in mind that would be good for this or any other resource we offer, please make suggestions. Thanks again!